Starting from Platis Gialos, we cruise towards Tinos Island, one of the most polymorphic and beautiful islands in Greece. 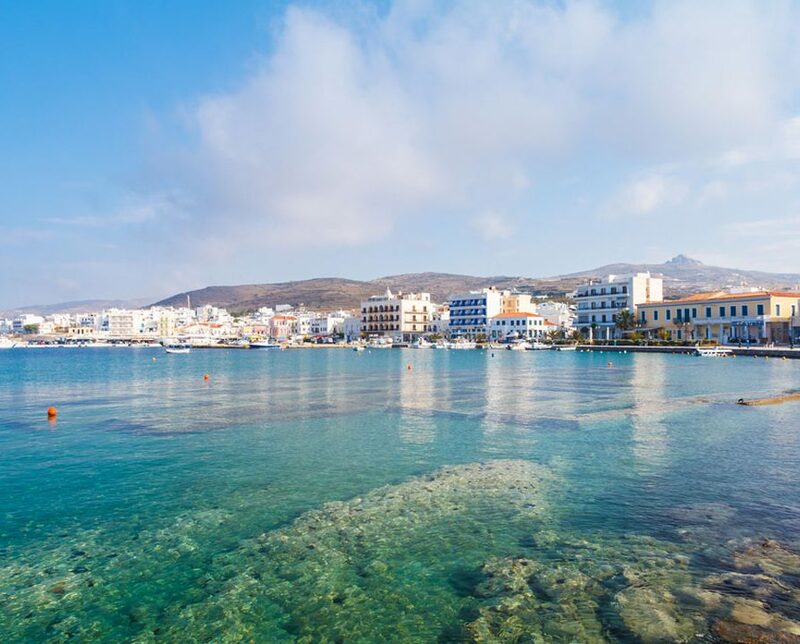 Tinos is one of the most important islands in Greece, attracting a large number of tourists, not only because of its grandiose church, but also thanks to its diverse landscapes, wonderful beaches, historic monuments and natural beauty. The island remains among the regions in Greece that are considered centers of culture, with sculpture and painting being developed and used even as part of the architecture. Hora of Tinos: The Church of Virgin Mary or Evangelistria Church at Hora is the most famous and among the most grandiose churches in Greece. It was built between 1823 and 1831 on the spot where was found the Orthodox Image of Virgin Mary. The Evangelistria Church is known as one of the most miraculous in Greece, since many people with serious illnesses have been cured after praying to Virgin Mary in this Church. This is why, many Christians from different parts of the world return to the Church every year to thank Virgin Mary, offer precious items made of silver and gold to the Church and most of them arrive from the port to the Church on their knees, as a token of gratitude. This is a unique image and revives at large on August 15th, which is a glorious day of celebration for the whole island. Agios Sostis: Agios Sostis is a sandy beach with calm, clean and shallow waters, absolutely safe for families with children. On the rock above the beach lies the homonym little church, built in the 19th century. There are also taverns, a beach bar and a sea wall for diving. This beach has a magnificent view to the island of Mykonos, specifically in the period of etesian winds that make the atmosphere transparent. Livada Beach: Livada is definitely the most impressive beach of Tinos. It has pebbles and crystal blue deep waters, surrounded by strange big rocks with numerous holes of various sizes. Kionia Beach: Kionia is a large pebble beach close to the island’s capital offering various services to its guests. The beach lays in front of the ruins of the ancient temple of Poseidon, the God of the Sea.